It's a funny thing about moving away from a place. Sometimes, you're surprised by the things you miss once you leave. Listen. 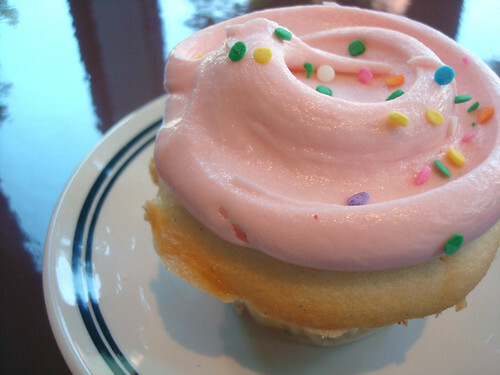 I lived in, and loved sweets in Seattle for eight years. Eight years! During my time living in the Emerald City, I pretty much knew every bakery and wandered the streets trying to find new ones--constantly. As such, it would have been impossible to declare favorites when I lived in Seattle, because I was so constantly trying new things. But since moving away, I actively miss some desserts...these ones rise surface as the things I wish I could have again, and which I actively seek out when I am back in town. So this is in no way a "best of" list, or a comprehensive one. 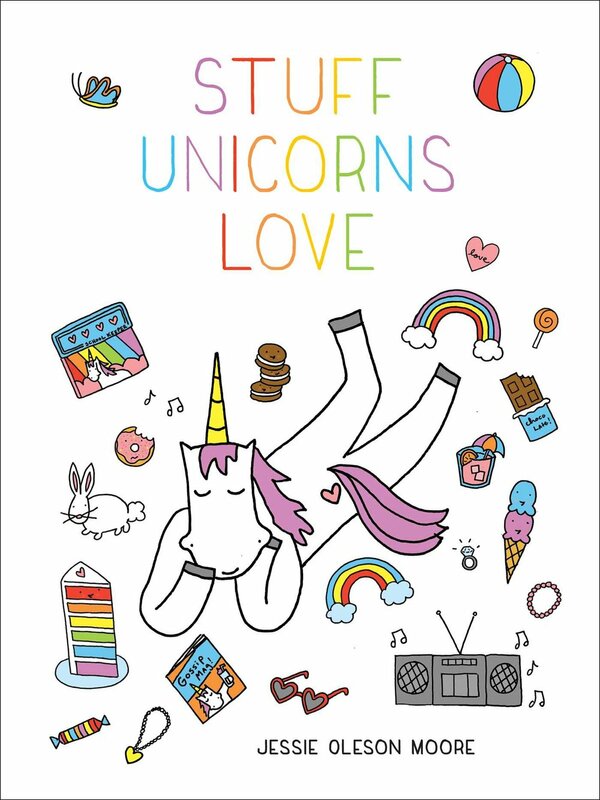 It's just a loving ode to some of the sweets I find myself thinking about most. Enjoy! The Wandering Goose Cafe opened after I moved away, but it is now it is one of my favorite places not only in Seattle, but on earth. And my favorite thing there? The biscuits. I am not sure how to explain the glory of these biscuits to you, other than to say that they're craggy, somewhat scone-like, and just about as full of butter as a foodstuff can possibly be. 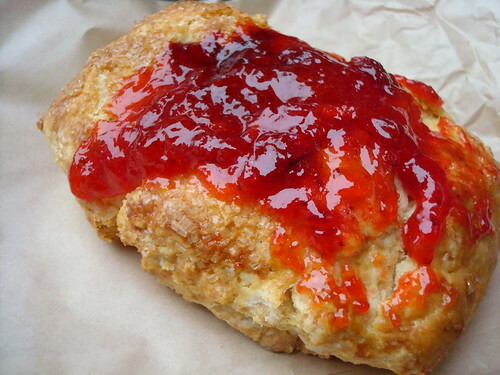 You can get the biscuits split with butter and jam, or gussied up in any number of ways. The best of the bunch, in my opinion, is the "Big Trouble", which is composed of a toasted biscuit topped with peanut butter, banana slices, and honey. Heaven on a plate. On my last trip to Seattle, I had it for breakfast 4 out of the 5 days I visited. Yep, I am a biscuit lover. And Seattle is home to so many biscuits I miss. I love Macrina's. Somewhat fluffier in texture and less craggy in appearance than the Wandering goose version, they're different but equally delicious. They have a sweet version, with a thumbprint of jam in the middle (strawberry or marionberry) or a savory ham and cheese one. Deciding which one is better is decidedly difficult. I miss these biscuits when I'm away. 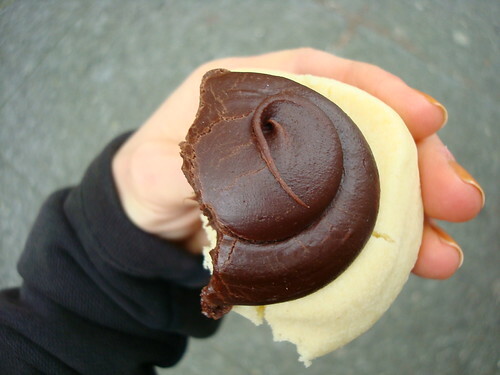 This is sort of like a Berger Cookie, if you've ever tasted one. The chocolate drop is a crumbly cookie topped with a huge dollop of rich fudgy topping. It's not necessarily a fancy cookie, but it does it for me. The cookie melts, with just the right amount of salt, and the fudge keeps you coming back for more bites. I love this cookie. I love Top Pot Doughnuts. The cafes are always stylish, and the doughnuts are always good. Listen. I rarely bother with yeast doughnuts, so I can't tell you much about the ones at Top Pot. But I can tell you that the cake doughnuts are pleasingly hefty and with a perfectly crispy exterior which leads to a soft, feathery interior. 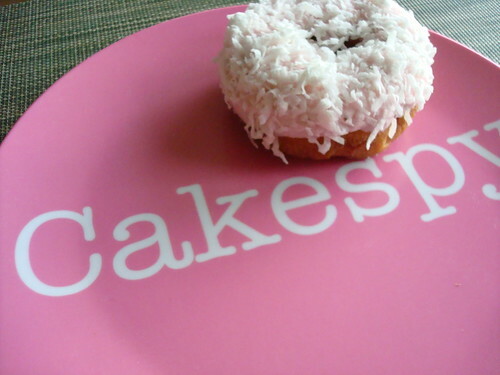 They're fancy-ish, but still accessible to those who prefer an old school, no-frills doughnut. They just make me happy. Cupcake Royale does something magical to create their cake, which is spongey but also dense at the same time, so it has a certain delicate nature but a satisfying weight and a flavor which satisfies. I've never tried a cake with quite this texture before. It's even better, of course, when you top it with a crack-filled buttercream and call it "Dance Party with Holly Hobbie", which is the cupcake's proper name. It is a food that always makes me smile, and I miss it like a friend. At Trophy Cupcakes, purveyor of pinkies-out cupcakes in the Emerald City, the variety I always hope to find is the Hummingbird. The banana cake should not be confused with banana bread--it's more delicate, with a finer crumb, though it's still very banana in flavor. Plus, I've never seen banana bread so awesome as to have a huge dollop of cream cheese icing on top like these little cakes. 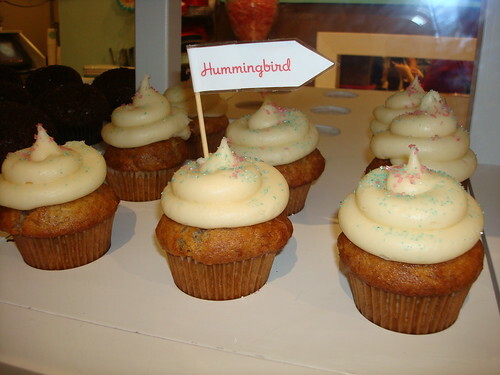 Kingfish Cafe is famous for its Red Velvet cake, but once I tried the Hummingbird there, I was hooked. 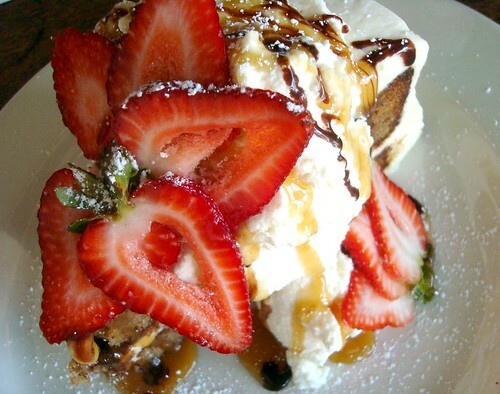 It's huge--about the size of your head, and covered in whipped cream and caramel and strawberries to the point where you wonder where the cake is. Dig through the toppings, because while they don't hurt, the real treasure is to be found in the cake, scented with banana and delicately sandwiched between generous layers of cream cheese frosting. I'd be lying if I told you I couldn't finish a slice by myself, as huge as it is. Whenever a friend asks where I'd like to go for dinner in Seattle, I suggest this establishment--mostly so I can order dessert. I hope they never stop making these cakes, though it's been a while since I visited (boo). I don't know if Bottega Italiano actually offers other flavors, because rarely have I even looked. 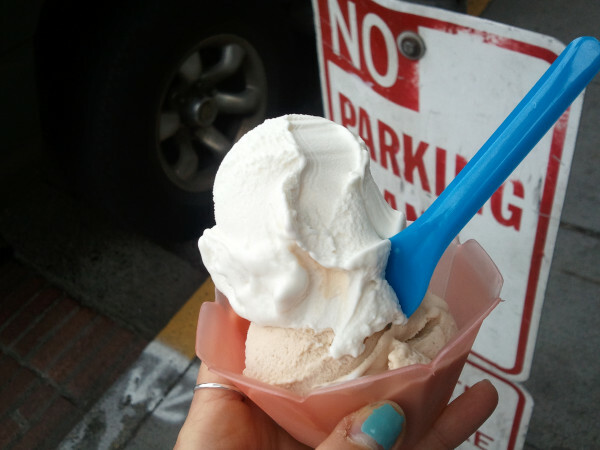 The panna cotta is where it's at when you visit this tiny gelateria on the First Avenue side of the Pike Place Market. It's so creamy, so dreamy, so perfect, that I never crave much else. A secondary flavor is mere formality. True, Nanaimo bars are actually from Canada. But Seattle is close enough that you'll see them somewhat frequently (at least, more often than most other American cities, I'd warrant a guess). 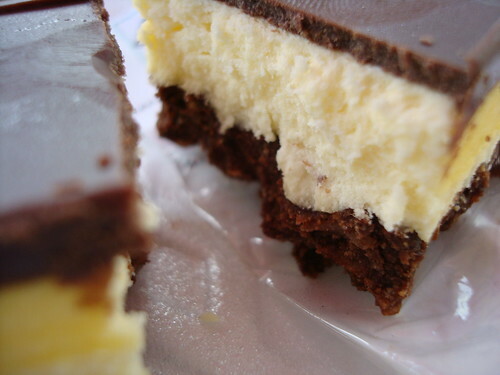 I love Nanaimo bars so hard. I think that they are a perfect food. If you want to learn more about them, or learn how to make them, you can search this site or check out my tutorial on Craftsy. Truthfully, this is an odd choice to put on the list because when it comes down to it, I don't enjoy eating the commercial variety of the pink frosted cookies all that much. I love bakery versions, which are all sort of riffs on the commercial ones. 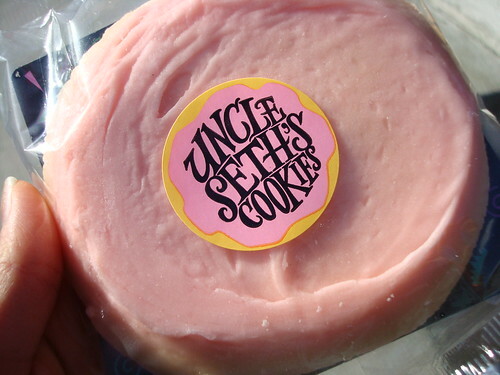 But what I really miss (I'm getting to it, promise) is seeing these cookies everywhere. They're ubiquitous in Seattle, and you can find them in grocery stores and gas station mini marts and unexpected places. They're very special, and have a sweet place in my heart. 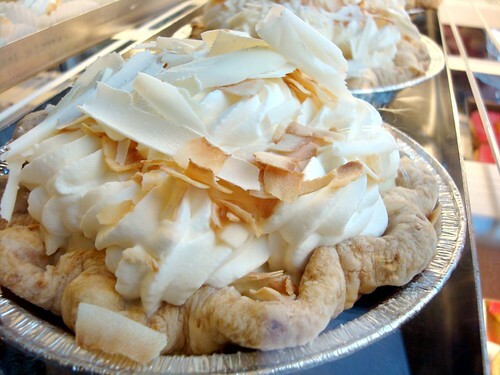 I like to tell people that even if coconut cream pie isn't their #1 choice, Tom Douglas' version (available at the Dahlia Bakery and several of his restaurants) might be the one to make them a believer. It's coconut through and through, with the creamy stuff in the crust, cream, topping, and flaked as garnish. And it's the good stuff, fat flakes which are clearly well-sourced because they're just so, so tasty. Try it--this pie is legendary in Seattle, and for good reason. Oh, I love custard! 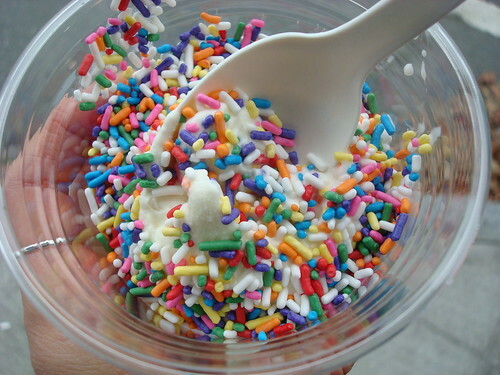 Old School Custard will top it in all sorts of ways, but my favorite is the vanilla version, with rainbow sprinkles. Really, this custard is perfect: unbelievably creamy, like you're licking the top of a pail of milk where cream has risen to the surface. Well, if that pail also had sugar inside of it and optional sprinkles as garnish, I suppose. Anyhow. I miss Old School Custard! What sweets do you miss when you're away from your hometown, or someplace you lived?